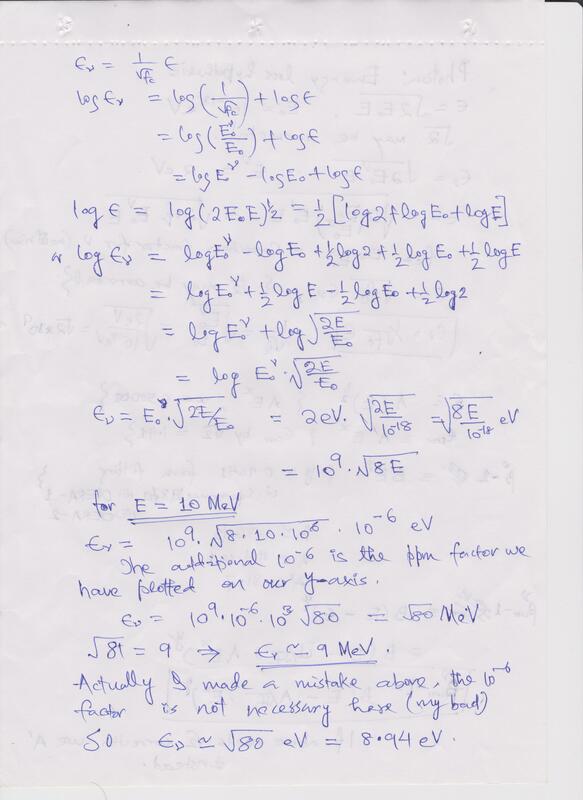 A correction in energy from 10^-15 TeV to 15 TeV despite of the photon mass being a tiny 10^-18 eV. In addition to the photon’s energy correction one also need to factor-in the neutrino rest-energy to see what we can infer about the neutrino speed excess results (or anomaly as for now) from OPERA. In the article above a detailed analysis was presented of why the neutrino speed-excess over speed of light may actually be understood by the laws of relativity as is already known since as soon as it was accepted as a valid theory, the experimental implications and the implications of Quantum Mechanics not with standing, if we are to take into account the various energy losses in the process under revision. In the article above there were a few errors that crept in, which do not dilute the qualitative understanding, but is significant if one needs to make quantitative inferences from my analysis. Hence I have corrected all the calculation, by checking many times over and making suitable changes to the fitting etc. I have introduced one more change from the last graph of the last article, hence now the energy loss of the neutrinos are also corrected for, in the same way the photon energy loss was considered. That changes the neutrino energy significantly only at the smaller scale of energy, eg thesupernovae 1987a was significantly shifted to the left because there could be a loss of ~9 MeV in the 10 MeV supernovae neutrinos (unless that was accounted for already which is very unlikely that it was done) But I have plotted both scenarios. But at GeV range eg OPERA point of (17,25) the energy shift (always to left) is only ~0.0003 GeV. Therfore on the log scale you see the experimental-data-points of both scene at the same place. Another change is teh correction to the hypothesis of photon energy loss, where if you check in the previous plot you will see 3 jumbled-up points. That was spooky, why should that have happened for a smooth function (2*E_0*E)^(0.5). That led me to check the calculations again and these 3 points shifted appropriately to fit with the new curve which is a “perfect” square root power (0.50001). The numerical factor in the lead of teh power also changed significantly. 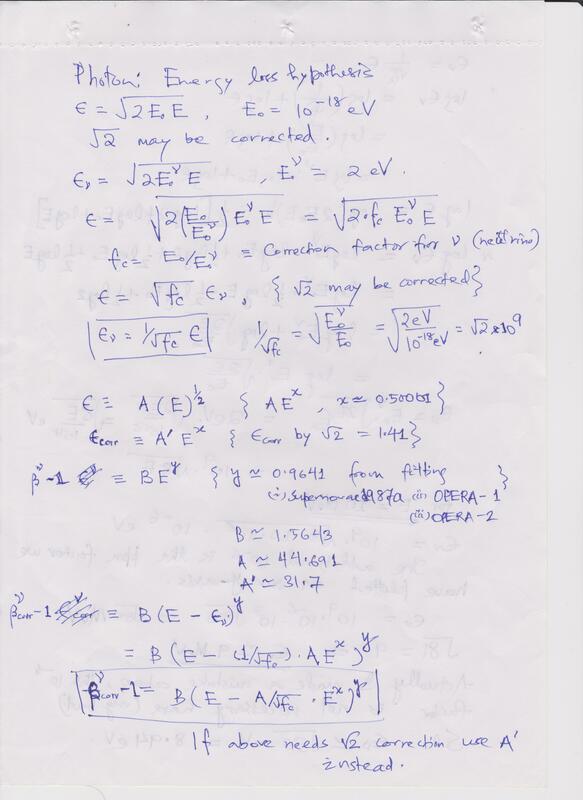 Hence the “sqrt(2) corrected” energy loss of photon also changed in that proportion. But the relative shift between these two hypothetical correction is really small as you can see them on the plot although it’s a log-log scale so in a non-loglog you will see the significant difference at very higher energies (I call them hypothesis in order that anyone may wish to come up with more understanding into this basic energy loss because of rest-mass/energy of photon, 10^-18 eV). 2. At very high energy (huge deals of energy like above TeV, there would be a vast change in scenario and only experiments have a say, and we do not have these experimental points, eg there would be channels available to the neutrino previously unavailable, there may be a Cohen-Glashow effect, if pertinent, there could be experimental resolution issues at these energies which with large energies may entail us better understanding. In any case the neutrino speed excess went down. Also I have shown the Uncertainity equation band (for an eye guide as an order of magnitude effect) and this clearly shows how someone can think of the effects actually effecting our experiment. eg the supernovae data-point is also quite measurable at such precision, well above the precision.The order of speed-excess per order of energy precision can be obtained from this, by correlating with the 4 curves shown here. The main point of the change is: I have removed the MINOS 1.8 sigma data from the analysis of the experimental fit, hence the obtained curve will act as a very important guide to where one may shift if there is a better experimental result from MINOS. As an intuition for now one can see that the 1.8 sigma result extending from 3 GeV to 120 GeV data sits around the present curve in a curved way much like a butter-fly-worm (caterpillars). I am not thinking of anything more at this moment. Hence I must take a break. ‹ The rotation of a fan creates a blocking path for visible light.